Arriving in Kathmandu for the first time can be daunting after a long flight. Don’t expect orderly queues or an organized entry -- getting sorted out is a rite of passage for flying into Nepal. Kathmandu’s Tribhuvan International Airport is busy and shows its wear. Stay patient, fight for your ground in queues, and ask where to go when not certain. Going through the disorderly entry process can be frustrating knowing that Nepal -- an exciting, beautiful country -- is waiting to be explored just outside. Don’t worry, you’ll be enjoying it soon enough! Don’t jump into the first long queue that you see after deplaning. Look for the tiny signboards above desks far to the front, and ask others in the queue for which part of the process are they waiting. Waiting 30 minutes to finally reach the desk, then finding out you were supposed to go to a different desk first is a frustrating experience! Don’t expect orderly or polite queuing, especially if waits are long. You’ll probably need to shuffle your feet and even stick out elbows to block attempts to cut line in front of you. You should be given a visa form and customs form from your airline. Having these already completed will give you a big advantage once arriving. If you didn’t get the forms, you’ll find English versions among the piles of paper above the tables where people are filling out paperwork. If that fails, push to the front of the queues to get forms from the immigration counter. Tip: Keep a pen and your passport handy to complete paperwork. The forms may be given out during landing when you can’t get to the pen in your carry-on bag. Also, don’t lose or toss your boarding pass with luggage code -- you’ll need it in the airport to claim your bags. You can attempt to complete the Nepal visa-on-arrival form online and print it before arriving in Nepal. Travelers have reported lots of issues with the form, including the fact that it is not secured with https -- personal identity information will be sent across the web unencrypted. You’ll still probably need to pick up an arrival card and complete it in the airport hall. If you don’t have official-sized passport photos of yourself, you’ll need to first fight for one of the electronic kiosks on the left. Scan your passport, complete the visa form, and allow the machine to take a photo. If you already have your own passport photos, you can skip the kiosk step. Tip: Passport photos come in very handy in Nepal -- bring several recent ones with you. You’ll need passport photos when getting a SIM card for your phone, applying for a TIMS card (required) to go trekking in the Himalayas, and in other instances. Unless you arranged a tourist visa at a Nepalese embassy before entering Nepal, you have to get a visa on arrival for Nepal. Completing the online visa-on-arrival form for Nepal is an option but not preferred until they implement better electronic security. Regardless of how you fill out the visa-on-arrival form (online, kiosk, or paper), you’ll need to know the exact address of your hotel in Kathmandu. Simply grab and keep handy a valid hotel address from a booking website or from your guidebook before arriving -- it probably won’t be confirmed. By default, all visas allow for multiple entries. You could technically leave Nepal and come back within the valid duration of the visa. After completing forms, you’ll approach the first counter to pay the visa fee. The preferred currency for payment is US dollars, however, other currencies such as British pounds and Euros are also accepted. Banknotes should be in decent shape, not torn or too crinkled. If your currency isn’t acceptable as a means of paying the fee, you’ll find a small currency exchange window to the right of the counter. Exchange rates aren’t the most favorable at this counter, so considering using ATMs or exchanging money elsewhere to get additional local currency for your visit. Nationals of SAARC countries do not have to pay for a visa. Indian nationals do not need a visa to enter Nepal. As of 2016, Chinese tourists do not need to pay any visa fees. Pocket the colored receipt and take the other to the next counter where you’ll give overall paperwork, photos, and receipts to an immigrating official and hopefully be issued your visa on arrival. Exit to the left toward the baggage claim area. Getting through the visa process will probably take so long that your bag will have been circulating the carousel for a while already. Security patrols the luggage area to help prevent bags from disappearing. Keep your luggage claim tag handy; you may be asked to show that it matches the tag on your bag. You’ll immediately be approached by porters wanting to carry your bags or “rent” you a trolley. 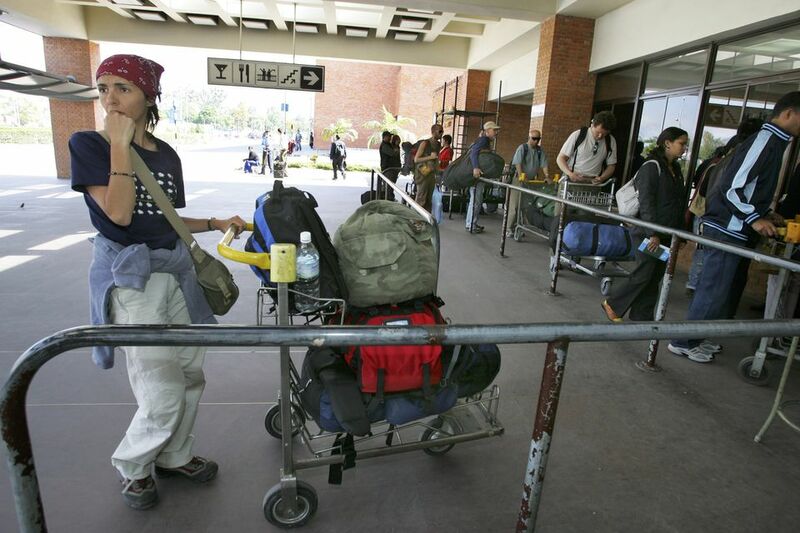 Technically, the airport trolleys are free -- don’t fall for your very first Kathmandu scam. After collecting your luggage, you’ll go downstairs to exit the airport. On your left, you’ll pass a currency exchange counter. Ideally, exchange only enough money to cover the taxi ride to your hotel, then use ATMs for a better rate thereafter. You’ll need to present your passport to exchange money. You’ll need the receipt when you exit the country if you wish to exchange any local currency back to your own. The single ATM is located outside the airport and may or may not be working. Turn right as you exit and walk a short distance to a foyer. The room is cramped, but keep your bags with you. Although the most expensive option, arranging in advance for a transfer to your hotel will save additional stress and hassle. You’ll see your hotel representative standing with a sign as you exit the secure part of the airport. This also saves waiting in yet another queue to exchange money or use the one ATM; you can just walk to an easier ATM from your hotel. The ride from the airport to Thamel during off-peak times takes around 30 minutes. Tip: There is no need to tip in addition to your fare. Don’t be surprised if even “official” taxis look as if they survived a war or three. If there’s room, keep your luggage on the seat with you rather than putting it in the trunk. On occasion, rogue drivers have demanded more money -- especially from passengers who aggressively negotiated a lower fare -- before releasing luggage held hostage in the back. Don’t expect drivers to have a lot of change; you may need to run into your hotel to break that 1,000 rs note just received from the ATM.